Illustration by Winslow Homer that appeared in Harper’s Weekly (Library of Congress). Combing through my great grandfather’s Civil War letters for a holiday season story, I learned how, in 1861, he celebrated Christmas in January. That year George A. Marden was a fresh volunteer in the Army of the Potomac on December 25, and just a month into his training at the U.S. Sharpshooter’s Second Regiment Camp of Instruction in Washington, D.C. The letters home— which were saved by his parents, back in Mont Vernon, N.H.— have been passed down to me through my family. From the tone of his Christmas day letter, however, Marden had not joined in the camps’ general merriment and was feeling pretty blue. The 22-year-old from the tiny town of Mont Vernon had volunteered for the Sharpshooters in November. That month he and his Company G comrades— all boys from southern New Hampshire—had traveled some 500 miles by train and steamship to their Camp of Instruction. The fresh recruit was spending what likely was his first holiday season away from family and friends. In his letter of December 25, he wrote of missing his usual snowy New England Christmas at home. Yet homesickness was not the only reason for the soldier’s low spirits. Despite the warming sunshine bursting forth on the 25th, the month of December had delivered its share of icy and wet days to the capital city. 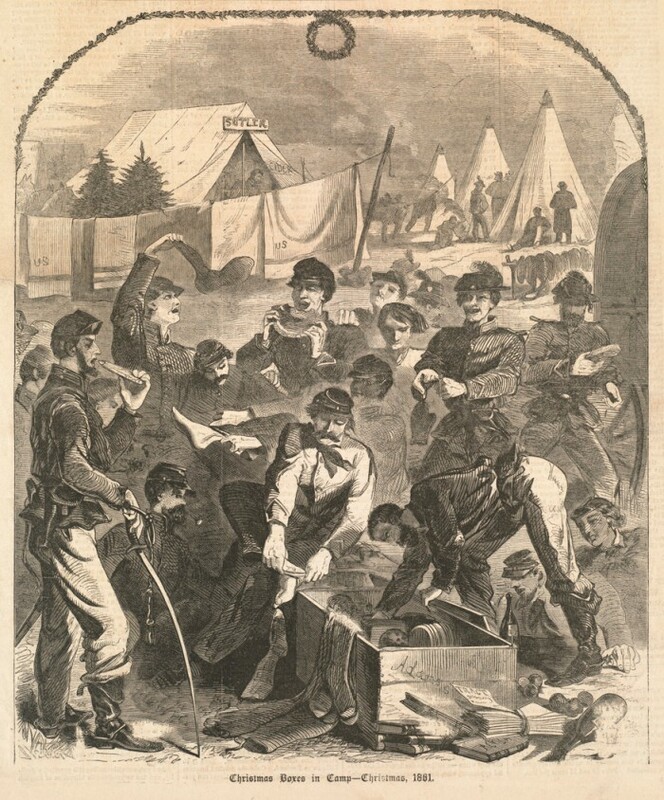 The soldier wrote that the harsh conditions were making camp life extremely difficult. The storm, he continued, blew down two hospital tents, leaving the sick inside exposed to the wind and cold. “In our Reg. the 2nd, of 700 men 150 are on the sick list,” Marden wrote. “Two men died night before last.” Just the week before, the soldier had visited one of the unfortunate soldiers— a Sharpshooter from New Hampshire he knew— as the man lay in his tent, on a bed of straw, suffering from measles and a bad cold and cough. Marden wrote that he shared much of his food with his enlisted Company G comrades, and delivered a portion of the “rear guard” chicken to a sick friend from New Hampshire soldier in another regiment. He also carried “a piece of the cake, a few of the sausages and a part of the brown bread” to one of the captains with whom he was friendly, perhaps hoping to bolster his chances for the promotion to sergeant towards which he’d been working. The soldier knew well that the cost of the various purchases and the shipping of the express barrel constituted a considerable expense for his parents. The gift of boots “I could wear” (as opposed to his uncomfortable government-issued footwear) were, to Marden, a treasure. They were made by his father, who owned a small shoemaking facility and shop in Mont Vernon. George had worked there when he was not in school, and his wages helped to fund his college education. As he continued his winter training in Washington during January and February, the cold and miserable weather slowly would improve. Yet, challenges of a more desperate and deadly variety awaited on battlefields in Virginia, Maryland and Pennsylvania. For Marden, those risks would commence when he was promoted to sergeant, transferred to the U.S.S.S. First Regiment staff, and shipped to southern Virginia for the Peninsula Campaign. But the Sharpshooter, like so many of his Army of the Potomac comrades, would weather war’s cruel hardships and carry on. 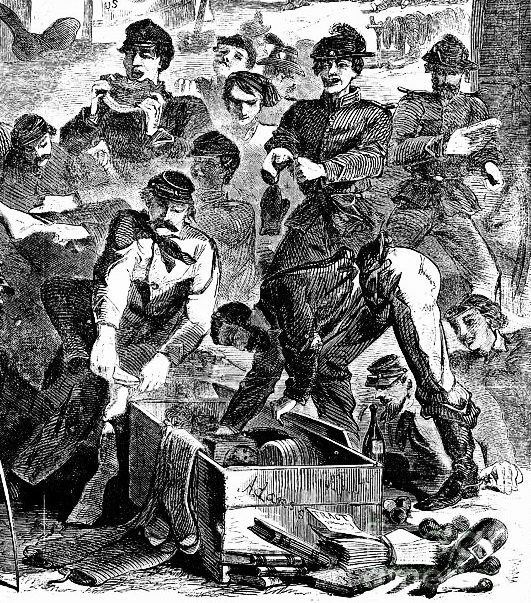 Letters and the occasional packages received from home—arriving at Christmastime or anytime— would play an essential role in boosting the soldiers’ morale through the Civil War’s darkest moments. * Ney had been a leader in the French army, and was well-known in Marden’s time. The Marshal’s command of the retreating French rear guard is credited with saving Napoleon’s forces from annihilation during their disastrous 1812 invasion of Russia. This entry was posted in Common Soldier, Holidays and tagged 2d United States Sharpshooters, Camp of Instruction, Christmas, Christmas boxes, Christmas in January, George Marden, Rob Wilson, Washington D.C., winter, Winter Camps. Bookmark the permalink. What a treasure these letters are. You can just hear the eagerness and appreciation in his words, and the mention of bringing “New Hampshire to their minds” with brown bread and sausages says volumes about Union soldiers far from home. Thanks for this post. Anyone have a recipe for brown bread? Thanks Meg. Unfortunately, my great great grandmother did not include her brown bread recipe when she passed George Marden’s Civil War letters down through my family. But do not despair! There is an authentic Civil War recipe for Yankee Brown Bread at http://www.geniuskitchen.com/recipe/yankee-brown-bread-297096. Enjoy! Rob–Now Mr. Place and I can both make Yankee Brown Bread! Huzzah! and thanks. Thanks for your thanks, Thomas. I’m glad you can use my post for your winter camp program. Hopefully you’ll have better weather than George Marden did! What a great collection. Letters (and stories) like these make me appreciate the things I have, like a roof on my head during a storm and good clothes when I need them. Great share. Thanks M.B. Your testimony to 20th Century conveniences is well taken. After reading my ancestor’s accounts of the cold, heat, disease and medieval medical practices he endured during the Civil War– which the found as dangerous as fighting the war– I too am glad to be living in modern times.